Home asbestos refresher CIH study tips continuing education free safety training Fullmetal Alchemist hazardous materials Indoor Air Quality industrial hygiene blog Industrious Hygienist OSHA Bored in Asbestos Refresher Class? Bored in Asbestos Refresher Class? I spend a lot of time in continuing education classes, including annual asbestos refresher classes. Some of the classes are a regulatory requirement and others are topics I'm interested in. Certifications such as the Certified Industrial Hygienist (CIH), Certified Safety Professional (CSP), and Certified Indoor Environmentalist (CIE) require a certain amount of contact hours for continuing education. I recently spent part of a morning texting a friend/client (at their request) to help them stay awake in asbestos refresher class. 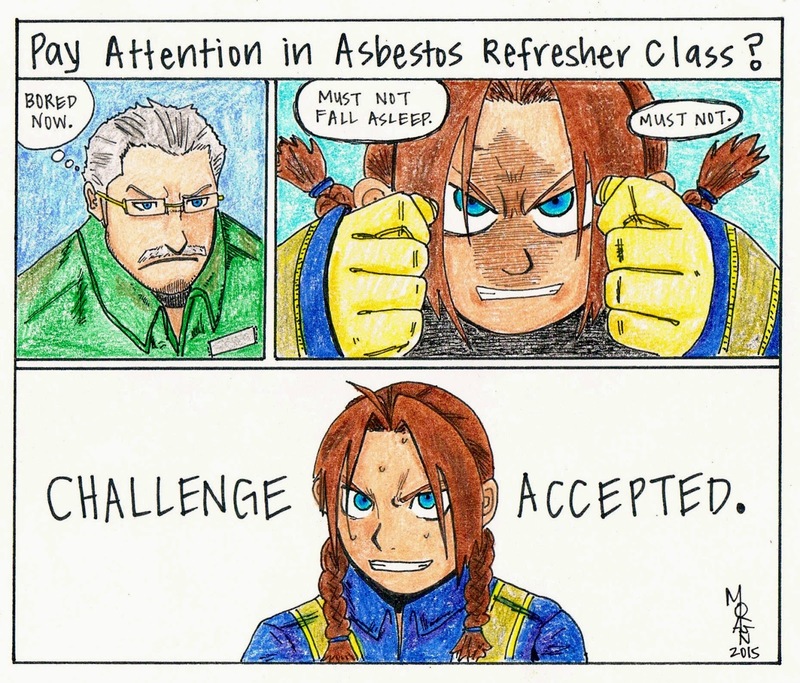 This got me thinking about all the times I attempted to keep focused during class in the 8+ years of various asbestos refreshers, to little avail. Attendees to asbestos refresher class can be very disruptive, using the class as a vehicle to network (loudly) with consultants, contractors, and building owners or representatives. Sometimes they'll spend the entire day texting and emailing, jumping out of their seats to take a call in the lobby, speaking just loud enough so the rest of the class can see how busy and important they are. Others open up their laptops and just work on projects during the refresher class. If there are snacks or coffee provided, you're guaranteed to have some obnoxiously loud slurpers or chewers. And, of course, I'll pay attention to new letters of interpretation or interesting arguments, answer questions when prompted, and complete the end of course test or assessment in record time. I drafted this latest Industrious Hygienist manga during the text session with my friend/client, hope you enjoy it. The Industrious Hygienist is never bored in asbestos refresher class!